The Peoples Democratic Party (PDP) has called on the international community to help Nigeria. This is in reaction to the call by the former Minister of Defence, General Theophilus Danjuma that Nigerians should defend themselves against killers. The PDP, in a statement issued by its National Publicity Secretary, Kola Ologbondiyan, on Sunday, said the pronouncement, coming from an army general, a former chief of army staff and former defence minister is weighty and directly reflects the ugly situation in the country. “While we restate our call for a UN monitored independent inquest on the security situation in our country, we stand with Nigerians in our moment of national despair even as we work collectively to restore our nation to the path of peace, national cohesion and economic prosperity,” the statement read in part. General Danjuma had on Saturday accused the Armed Forces of colluding with those behind incessant killings in the country. General Danjuma told hundreds at the Taraba State University convocation in Jalingo, the state capital that the military was not neutral and was covering those behind the attacks. 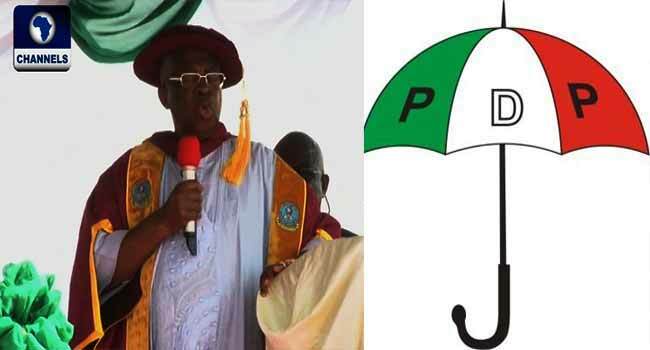 PDP said further that General Danjuma’s statement justifies its stand that President Muhammadu Buhari and the All Progressives Congress (APC) must be held responsible for the attacks in the country. The party also lamented over the killed by insurgents in Benue, Taraba, Yobe, Gombe, Kaduna, Adamawa, Borno, Plateau, Nasarawa, Rivers, Enugu, Kogi among other states. “It is instructive to recall that former Presidents Olusegun Obasanjo and Ibrahim Babangida, both former military leaders, army generals and patriots, had earlier raised the issue of bloodletting and pogrom in our country under the APC. “Painfully, the APC-controlled Federal Government has not only failed in finding solution but is also contending with allegations of conspiracy and acts that are believed to have emboldened attacks against innocent Nigerians,” PDP said in the statement. They also called for action to be taken by President Buhari against the Inspector General of Police, IGP Ibrahim Idris, for flouting the presidential orders that he should relocate to troubled Benue State in the heat of attacks on the state.